Good job! 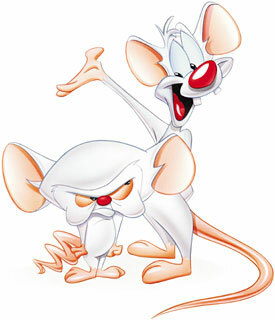 Love the Pinky and the Brain. Maybe Canada can at last be ruled by the rightful government. Sorry David Canada’s Parliamentary Democracy isn’t (as you know most governements aren’t) a fully “We the people.” democracy. Such does not entirely work well, just look south. We the people like to own guns, we the people like to hate other people there are certain limits to liberty even for the masses. It has been argued that the hatred of the Jews was a socially accepted concept in prewar Germany. You might want to read “Hitler’s Willing Executioners” (1996) by American writer Daniel Goldhagen. Though like most history majors I don’t entirely follow the thesis that the pursecution of the Jews was hardwired into German society it does show that if given the one man one vote kind of democracy the Jews would still have had trouble in 1930-40s Germany. I will pass on the “we the people” kind of demacracy. We elect those we think will best govern us I am not convinced that government by the masses s a good idea as masses turn into mobs. wow… so like a list of what Cretian did then eh? but with Cretian you can also add to the list… choking civilians. 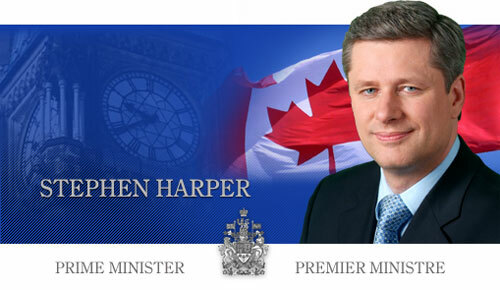 Guess what, Canada, Harper hasn’t bothered to wait for a Majority…his “real agenda” is as plain as day. If democratic institutions are in the way…run them over. If anyone disagrees respectfully with your ideas…kill them with silence (for now). Give the media great shots of the back of your head. Disparage the opposition and manipulate the issues always with a focus on the lowest common denominator. Gag your cabinet members and place them on puppet strings while you’re at it. Nullify the Bureaucracy using PMO and PCO….Mr. Harper, your “real agenda” is more than obvious to all of us. It’s time for you to go home. not work for the same reason our left right two party ideal does not. appeal to a target audience so that you buy their crap. The agenda is what they tell us it is, not what we tell them it is. Top down, not bottom up. disability or sexuality and sent to his death camps. the sand, then I the individual is not able to exist. ahh.. an oh so timely link for you. I can’t help but wonder if people actually know anything about proroguing or if they are maybe hearing something completely different when they hear it being spoken about. I certainly see a lot of drooling over it, just as people drool over that wonderful Ukrainian treat, the pirogi. Dave let’s not even take the first step down that path. You know good and goddam well, that I do know about proroguing. The other thing that I am good at that you are not, is staying on topic. Once again you have chosen not to read what I have written and instead read between the lines making up your own interpretation. I am on topic “Canada”, every thing I have started with is a point to your topic, and all further comments are to defend myself from people pointing fingers at me calling me a neo con or some delusional dope smoker. I don’t know the last time I smoked dope and I am not a conservative, in fact my politic is liberal, but not the hand out type professed by the party of that name. I am completely against the European modeled idea of legally binding racial definitions and the created limitations of rights for specific minorities handed down by these same magically enlightened and supposedly rational Europeans. SUCH a useful list, girl. Thanks so much. Have been sharing & will keep doing so. Also printed a hard copy – we need this list – there’s just SO much to remember about what the man has done…wrong.